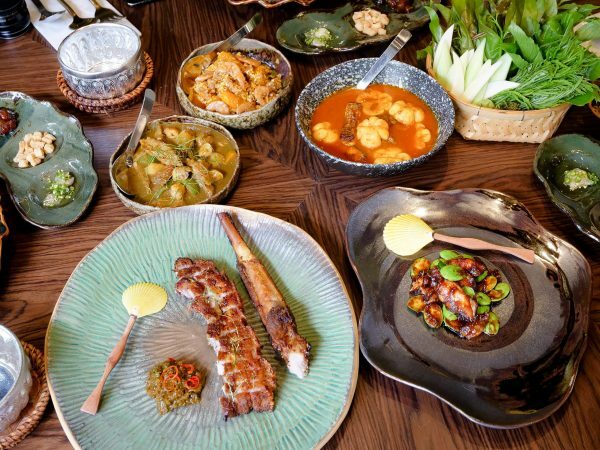 Khua kling (คั่วกลิ้ง) is one of the pillars of southern Thai cuisine, a dish that you’ll find throughout the south of Thailand, and in every restaurant serving southern Thai food within Thailand. 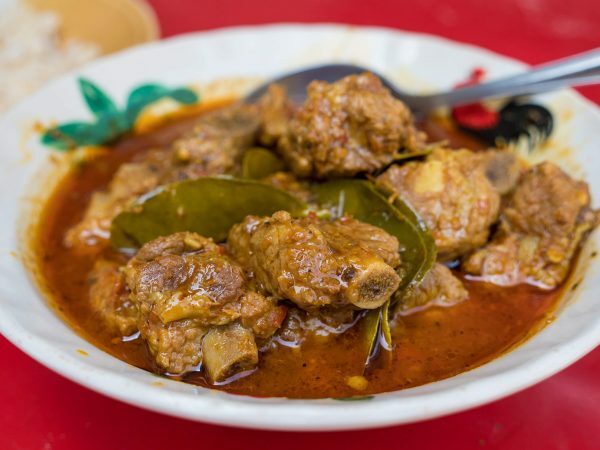 It’s basically a dry meat curry, and though I’ll be making this recipe with pork, you can really use any type of meat you’d like – from beef to chicken – and you could even use other meats if you’d like. Once you have southern Thai curry paste, you can check out the recipe for that here, khua kling is actually really simple to make, and it tastes incredible. The base of any plate of Thai khua kling (คั่วกลิ้ง) is meat, and if you love spicy meat, this is a dish you’re going to love. 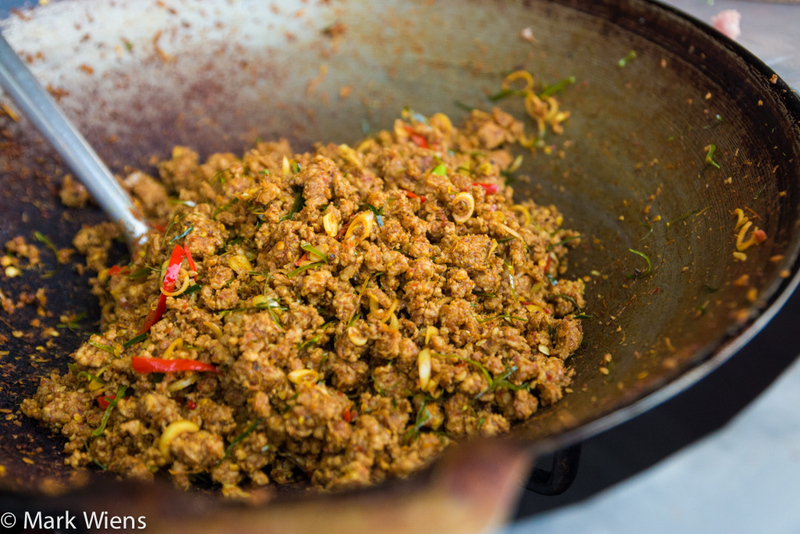 In Thailand you’ll find versions made with either minced meat or with small slices of meat – and really, both ways are incredibly delicious, just up to your own preference of meat texture. For meat, pork is common and that’s what I’m using in this recipe, but beef is equally as common and equally as delicious. 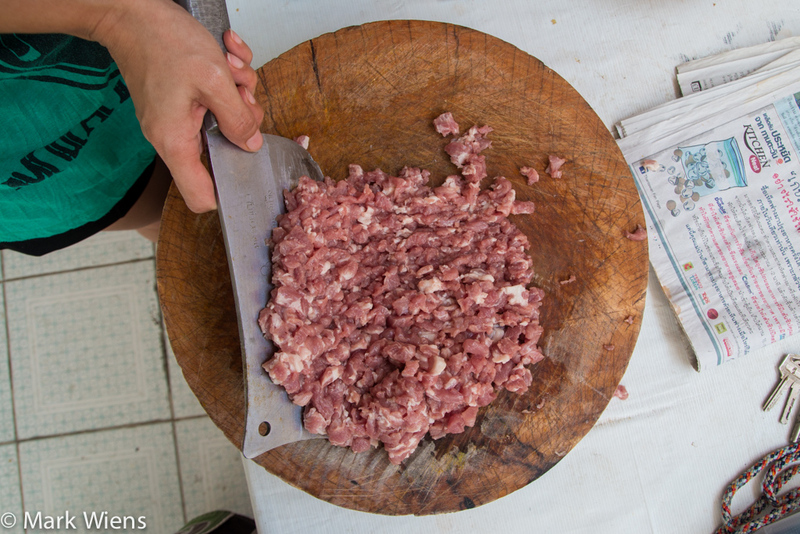 If you want to get sort of a coarse mince, which I think works well for this dish, you can mince it by hand, by just chopping the meat over and over again using a Chinese style cleaver on a cutting board. Along with being flavored mostly with a generous amount of southern Thai curry paste, one of the key flavor enhancing ingredients in khua kling (คั่วกลิ้ง) is finely sliced kaffir lime leaves. I love finely shaved kaffir lime leaves so much that I like to add some to the meat while it’s being fried, and add more to garnish on the top of the plate at the end (watch the video, below, for all the details). 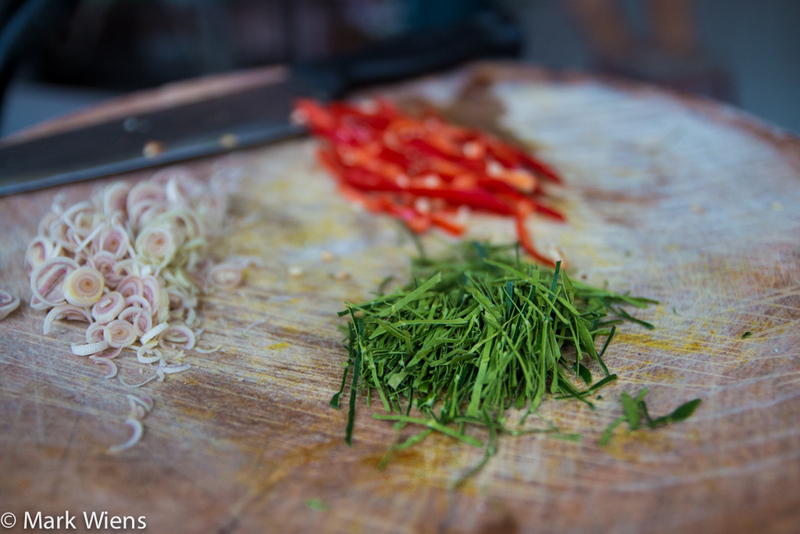 At restaurants in Thailand you’ll find that some use finely sliced lemongrass as well, while other don’t. I personally love the addition of fresh lemongrass, so I chose to include it in this recipe. That’s all the ingredients. Like I mentioned above, as long as you have already made southern Thai curry paste, or if you have some on hand, this recipe is easy to make and extremely tasty. 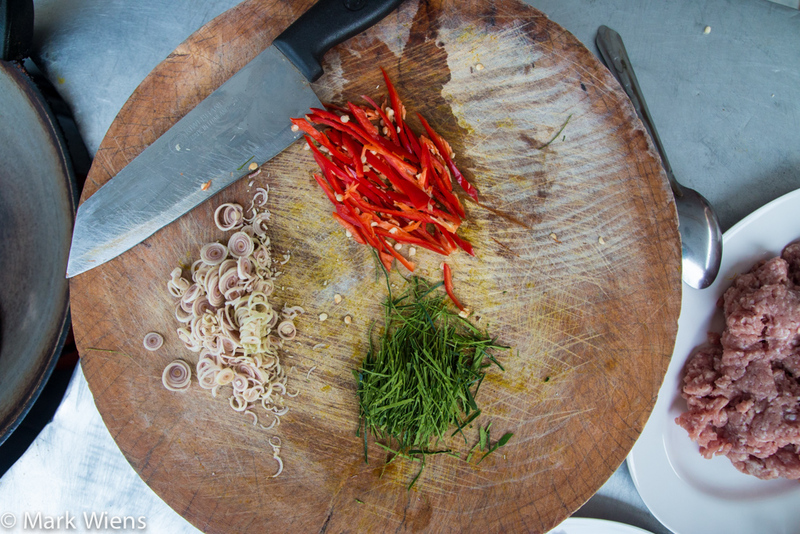 The first step is to just take your lemongrass, the red spur chili, and the kaffir lime leaves and shave them finely. Especially for the lemongrass and the kaffir lime leaves, the finer you shave them, the more flavorful they will be, and the softer they will be to eat. For the kaffir limes leaves, I like to grab about 5 or 6 leaves, and fold them over to create a bunch of layers before slicing. This makes it much easier to start shaving them in tiny strips. Since khua kling (คั่วกลิ้ง) is a Thai dry curry, you don’t need to use any oil while frying it, like you would in many other Thai or Chinese dishes. It also helps to have quite a lean cut of meat, so that not too much oil or moisture comes out when cooking – you want the meat to remain nice and dry until being served. The first step is to start frying the southern Thai curry paste, and as soon as you add it to a medium hot wok, it should immediately start to smell incredible. When you fry the meat, it might get really dry, but just keep frying and keep scraping the bottom of your pan. Eventually some moister, and the small amount of fat from the meat, will give you enough liquid to work with. You shouldn’t need to add any water, just keep frying it until the meat is all the way cooked though. Once the meat is fully cooked, you might have to do a little bit of taste testing, just to confirm your khua kling (คั่วกลิ้ง) tastes amazing. Your curry paste might be a little different from mine, so you might need to add in a bit more curry paste, or salt, or whatever seasoning you think it needs. Before you start cooking, make sure you watch the full video of this recipe for all the preparation details. Eat it with: Rice and a variety of other southern Thai foods, like curry and soup – more recipes coming soon. 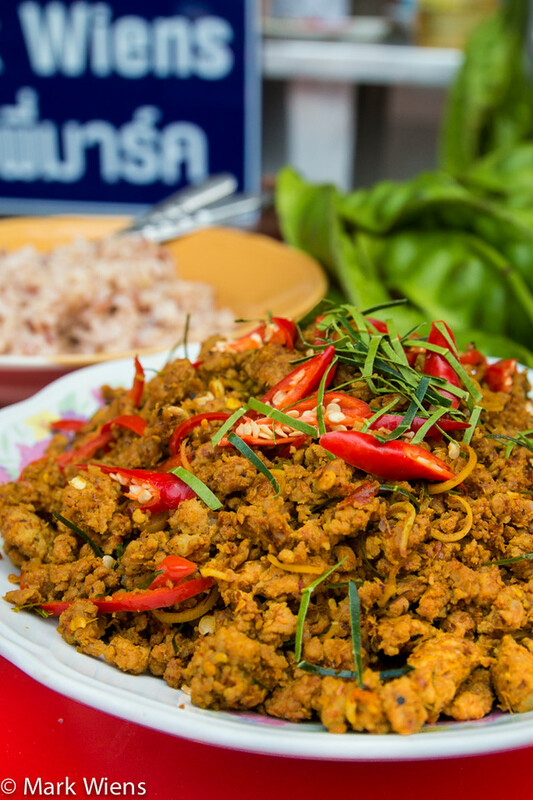 Khua kling (คั่วกลิ้ง) is one of the most well known southern Thai food dishes. It's a dry curry, almost like a minced meat sausage. Though I'll be using pork for this recipe, you can really make it with whatever type of meat you'd like. 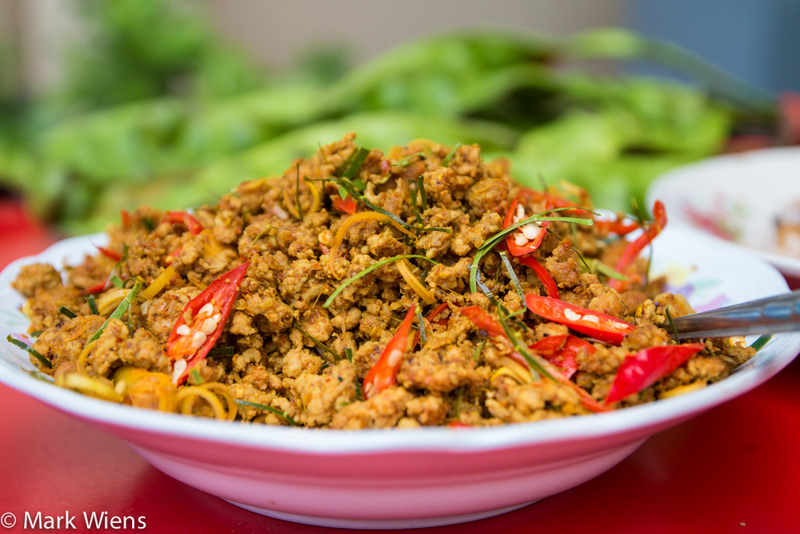 The meat is stir fried with southern Thai curry paste, and finely sliced lemongrass and kaffir lime leaves. 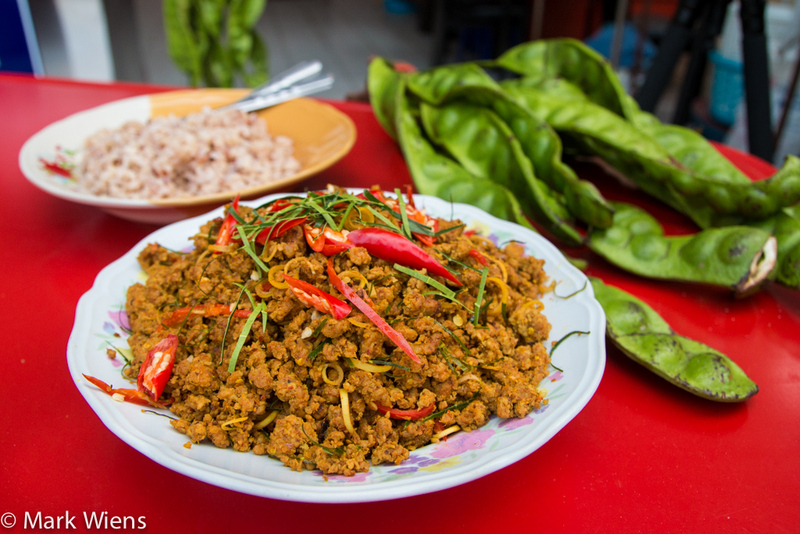 If you love spicy meat, you'll love Thai khua kling (คั่วกลิ้ง). Also, if you haven't watch the video, watch it here. The first step is to take your lemongrass, slice off the bottoms of the stalks, tear off two or three of the tough outer layers, and then finely shave it. The finer you shave the lemongrass, the more flavor it will add, and the the easier it will be to chew. To prepare the kaffir lime leaves, you want to grab about five or six leaves, which come as a pair, then I like to fold them over, so you’ve got a nice layered sandwich of kaffir lime leaves. Slice off any of the big stems if there are any, and then finely slice them into thin strips. 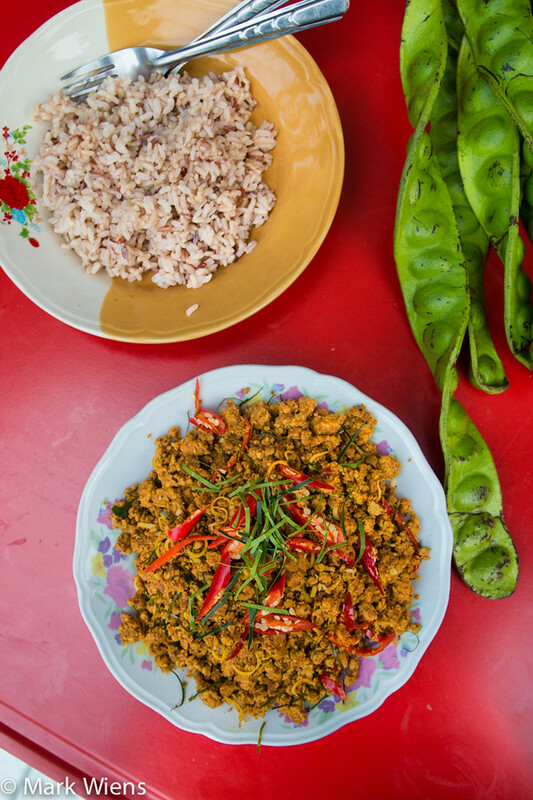 I included the spur chili in this recipe mostly to give the khua kling (คั่วกลิ้ง) a beautiful red accent color, but it's not what gives the dish its spice - that comes from the curry paste. For the spur chili, just cut off the stem, slice the chili in half, and then slice it into thin diagonal strips. Set all those ingredients aside, and we'll come back to them later. Turn on your stove to a medium high heat, heat up your wok or pan for a few seconds, and then add about 3 tbsp. of southern Thai curry paste (it may be kind of dry, but since this is a dry curry, you don't want to add any oil). One of the tricks my wife taught me, so the curry paste doesn't burn, is to quickly add in just 1 spoon of meat into the curry paste and start to stir fry it. This will give the curry paste a little extra moisture, but it will still get that direct heat that you want, so the curry paste reaches its maximum flavor potential. 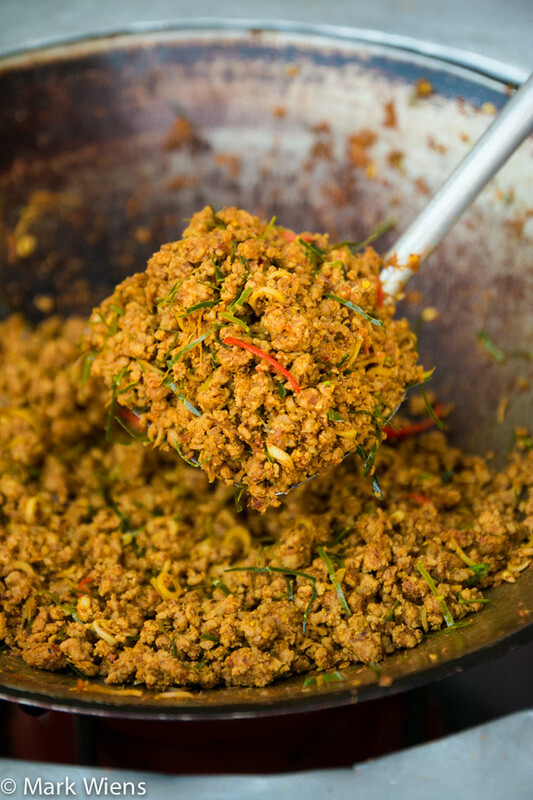 Fry the curry paste for 2 - 3 minutes, and then add in the rest of the meat. Your pan should be quite hot, and due to the dryness, it might start to stick to the bottom. So you want to really work the wok hard by scraping and getting all that good flavor off the bottom of the pan. Stir fry the meat until it’s broken into small minced pieces, and almost all the way cooked through, then toss in just a pinch of sugar, depending on how much you like (I used about ½ teaspoon, but I know some Thai cooks would use a whole spoon in their recipe). Give it a quick stir, then add the lemongrass. Quickly stir it, then toss in about ¾ of your shaved kaffir lime leaves. Stir fry for about 1 minute. Just a few seconds before turning off your heat, add the sliced red spur chili, stir fry for a few more seconds, and turn off your heat, but keep frying for another minute or so. Grab a bowl, and dish out your khua kling (คั่วกลิ้ง). The final step is to take the remaining portion of your finely shaved kaffir lime leaves (of you can slice more if you used them all), along with a handful of sliced Thai bird chilies, and sprinkle them on top of your plate of khua kling (คั่วกลิ้ง). As long as you have a batch of southern Thai curry paste ready to go, this recipe for khua kling (คั่วกลิ้ง) shouldn't take long. You can serve khua kling (คั่วกลิ้ง) with a fresh plate of rice, and a combination of other southern Thai dishes as well. Enjoy! 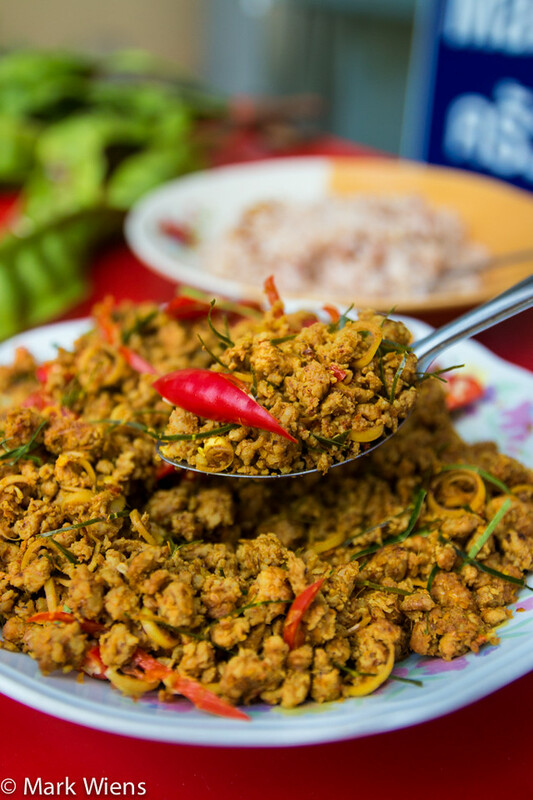 Khua kling (คั่วกลิ้ง) is one of standard dishes you’ll find in southern Thailand. I like to compare it to a strong flavored dry sausage that’s lean and with no casing; It’s a heavily spiced meat dish. The southern Thai curry paste is orange from turmeric, and it gives the khua kling (คั่วกลิ้ง) a beautiful, well rounded flavor, with garlic, lemongrass, shallots and chilies. The addition of more lemongrass and finely shaved kaffir lime leaves contributes to balancing the spicy meat with a fresh citrusy component. Whenever I eat at a southern Thai restaurant in Bangkok or anywhere in Thailand, one of the dishes I can never do without ordering, is a plate of khua kling (คั่วกลิ้ง), and luckily, it’s pretty straight forward to make it at home too. Do you love khua kling? 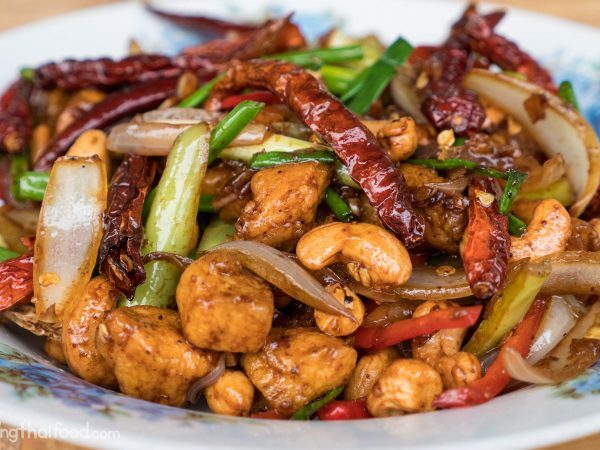 If you enjoyed this recipe I would be grateful if you would give it a 5-star rating, and share it with a friend who you know loves Thai food (share it on Facebook or send them a quick e-mail with a link to this article). It would really help me out, and I think they may enjoy the recipe too. Thank you in advance! 29 comments. I'd love to hear from you! Got a great idea…….gonna throw in some raw sataw halves into the cooked khua kling for added color, crunch and flavor!! we really enjoy your video’s and recipies. we are already try it out by ourselves and ordered locally, very funny. specially if we see you to eat so enormous enthousiasims. Hey Ruth and Marc, great to hear from you. Glad you enjoyed it. Thank you for watching haa! excellent recipe, this was always my favorite dish in Thailand and with the southern curry paste it really tastes authentic (i actually made the paste so I could try this dish). I put in more paste than 3 spoons though, more like 6. Also added a fair amount of fish sauce. Good stuff!!! Nice one Mark, I lived on KoPhiPhi for over a year and this was one of my favourite lunch time eats accompanied by sticky rice in mint leaves ….. do you have a chicken rice soup recipe ? Our son made this for us tonight. It was absolutely wonderful. It did help having made the curry paste beforehand for the jungle Thai duck recipe which was wicked! The curry paste freezes well so once it’s made the dishes are easy and so flavorful. We love watching your videos. Keep up the good cooking and eating. No one in Florida is eating as well as we are from your recipes. Thank you!! Very cool to hear that Delis, glad you enjoyed it! 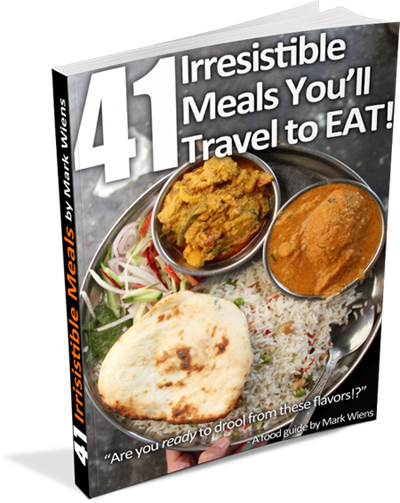 Mark – Great recipe thanks for sharing!!! Hey Andrew, you’re welcome, glad you found some kaffir lime leaves, enjoy! If you find yourself in Koh Lanta again soon, check out Krua Dan Tai (ครัวแดนใต้), near Phra Ae beach. Their khua kling is out of this world flavorful and spicy! As a Thai person born in America, this was one of my first experiences with southern Thai food, and I have to say I’m totally hooked! Hey Amy, great to hear from you, and thank you for the recommendation. I will remember this for the next time I visit Koh Lanta. Hope you’re having a wonderful trip! i live in the philippines and have always loved thai food. i was able to try khua kling in my thailand visits and have always craved for more. now that i miss it much, id like to do it at home, too. only that, where im from, theres no kaffir lime leaves sold. maybe in manila or what but not where i am. question is, can u recommend another to substitute the lime leaves? Hi Marco, good to hear from you, glad you enjoyed khua kling when you were in Thailand. Hmm, it’s a tough thing to substitute, you might try either leaving it out, or your could try maybe some lime peel – or anything with a bit of a zesty flavor to it. Let me know how it goes, and enjoy! Sounds good and look delicious,I will give it a try. Thank you Joan, let me know how it turns out. After living in Thailand (Isaan) for 6 years, I just recently discovered this dish. A colleague came back from a trip to Hua Hin and brought some back. He asked me if I’d ever had it and I said I hadn’t. He said it was too spicy for him (he’s Thai) and I could have it, I loved it and had him write the Thai word for it, I showed it to my wife, who is a great cook, and she told me she knew how to make it. It’s now on my regular menu (along with larb, which is somewhat similar, although a different taste). That’s great, thank you for sharing Tony, glad you love khua kling as well! My wife watched your video and gave it her Seal of Approval! I just recently discovered Thai food and loved the flavors and cmbinations of ingredients. However i have never tried to prepare any dishes. This will be my first. Wish me luck! Hi Fabiana, great to hear you enjoy Thai food too. Good luck with the cooking, enjoy!